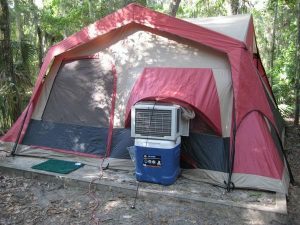 A tent air conditioner is a cost-effective solution for camping during the warm parts of the year. An air conditioner makes a big difference in tent camping when the temperatures are extremely hot. Camping tent air conditioners come in a compact design, yet they deliver a powerful breeze of cold air. Many do run on electricity so you will most likely need a campsite with a power source. A tent air conditioner will not run as cold as home units, as there are small openings all throughout the tent. Due to the lack of insulation, the AC unit is going to work harder. We took a look at some of the industry’s top camping tent air conditioners and here are our 5 top best picks. The EdgeStar Ultra Compact Portable Air Conditioner is great for small to medium-sized tents. The unit is equipped with three modes – fan, dehumidification, and cooling. It features a 24-hr programmable timer so you can set it to turn on and off at selected intervals. This unit also comes equipped with a 3-speed fan that has directional air discharge louvers. The thermostat is an adjustable digital control for precise settings, also fitted with a remote control for ease and comfort. This unit runs on water, as well as electricity, so no chemical coolants needed. It also comes with an extendable hose for drainage. The unit beeps and tells you to empty the water reservoir once it’s full. It can be difficult to drain if you don’t use the hose. The EdgeStar is easy to move as it is constructed with wheel casters for easy rolling. A window kit is included in case you want to mount it in your tent. The kit is well-constructed and features a functional design. This unit is pretty easy to install at the lower walls of the tent, you just need to know the measurements of your tent before mounting it on your wall. It comes with a carbon filter that filters out small debris and foul odors, so you stay cool and fresh inside your tent on those scorching days. The compact GoCool Tent Air Conditioner requires a 12V power source before usage. This compact piece comes with rolling casters and a retractable handle for the ultimate portability making it easy to move from location to location. In addition to electricity, this cooler also needs water and ice to run. The unit can hold 4 one gallon jugs, 9 two liter bottles, or 40 lbs of bagged ice. The ice melts pretty fast so make sure you have tons of it for replacement every few hours. The unit dehumidifies warm air inside the tent by replacing it with air cooled by the ice. No coolant chemicals are needed for this unit to function. The GoCool includes a 6-ft tubing for easy drainage. You can set the A/C near the doorway of your tent and place the pipe outside of the doorway so it drains right to the ground. It also features two automatic settings – high and low; however, you can set the degree of coolness you want by manually clicking the cooler and warmer buttons. There is no directional air discharge option so this unit only cools smaller floor areas. It is not ideal for medium-sized to larger tents and will not disperse air evenly throughout the tent. 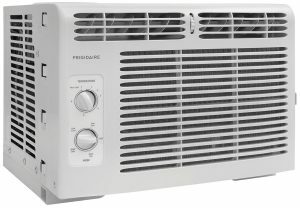 The Fridigaire Window unit is a compact 5000 BTU cooling system that runs on electricity alone, no water or coolants needed. You will have to ensure that you can access electricity at your campsite. It uses standard a 115V electrical outlet and includes a window mounting kit. It runs quietly, has a high power efficiency rating, and is lightweight. There are not wheel casters for mobility, but it’s light enough that carrying it won’t be a huge difficulty. There are three air modes featured on the Frigidaire Window-Mounted unit – auto, high, and low. This unit produces strong wind forces that will quickly drive warm air out and cool the tent’s interior. It will also dehumidify. It comes with a remote control to make changing the settings easy and comfortable. There are also foam pieces and a plastic frame for mounting the unit on the window of your tent. The Frigidaire is equipped with a washable mesh filter with side, slide-out access that reduces bacteria, room odors and other airborne particles for a healthier, more comfortable environment. It also features mechanical rotary controsl in the fans that operates at 2 cool speeds, 2 fan speeds and offers 2-way air direction. The EdgeStar is a large, remote-controlled 14,000 BTU portable air conditioning and heating unit. 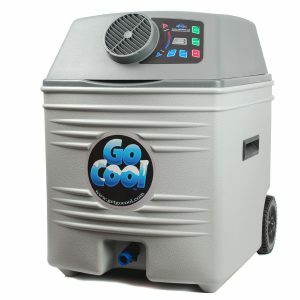 It is equipped with a dual hose that provides both cooling and heating. This is a great camping option as it can be used all season round for all of your camping needs, both hot and cold. It has a wide temperature range of 60-88 degrees Fahrenheit. This air conditioner unit is equipped with a digital LCD display make changing settings a breeze. Which can cool up to 525 square-feet, which is perfect for a family-sized camping tent. There are three modes – fan, dehumidifying, and cooling. It also comes with an auto mode that allows you to set a timer and program an automatic restart should you run out of electricity in the middle of the night. There are no coolant chemicals necessary for operation. This unit dehumidifies as well as cools, so it will remove up to 71 pints of moisture a day from the air, leaving your air both cool and dry. 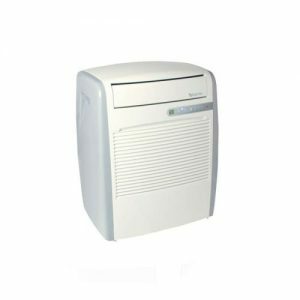 It features a dehumidify only mode, fan only mode, and 3 different fan speeds. This unit also comes with long tubing for drainage as well as a window kit for mounting. In addition, it includes casters to make moving the unit easy. The Avallon is a 14,000 BTU portable air conditioning unit, perfect for cooling larger tents. 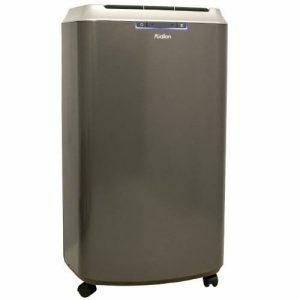 It features auto mode, in addition to three separate modes – fan, cooling, and dehumidification. It comes with remote control for ease of use and comfort in changing the settings. This units comes with wheel casters so it is quite easy to carry around. The Avallon alos features a window kit for easy installation into your tent window. This cooling system is equipped with a dual hose for easy drainage. Separate intake and exhaust hoses allow for more air intake, more cooling power, and a more stable air pressure. This provides a faster cooling rate compared to single-hose units. The Avallon also includes an InvisiMist feature which helps evaporate water, even the most humid of climates. When excess water accumulates in the unit’s reservoir, the InvisiMist function will automatically begin working, first pumping the water from the reservoir through the connected vent hose and then transforming the water into a light mist before expelling it outside. This prevents your unit from suspending cooling due to a full reservoir and also lessons the drainage’s burden and keeps you from having to frequently check and empty the water resevoir. This unit can also turn into a heater as well. It is quite a heavy unit at 73 lbs and can take a while to begin cooling. 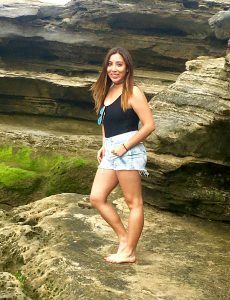 The simplest camping air conditioning units are battery-powered fans or evaporative coolers. When opting for a fan, look for one designed to mount to a window so it can draw in fresh air from the outside while cooling the tent. More complex AC units require 12-volt power supplies and use ice chests to develop cold air to blow into your tent. Check to see whether the unit requires a power supply and determine if you’ll be able to power it at your campsite. Also, consider other necessary supplies like water and ice required for use with tent air conditioners. If your campsite is powered, almost any air conditioner will do the job. You want to go with a compact design but not sacrifice power. For 150 square feet of tent you will need a unit that is about 5000BTU rated, any less and it will struggle to keep you cool. 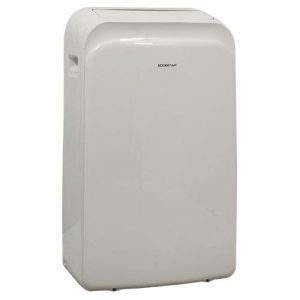 The best tent air conditioner is the most compact one that can deliver an excellent cooling capacity. If the A/C is too big for your tent, the inside will feel cold but damp. Conversely, a small A/C for a family-sized tent will cool only a particular spot and leave the rest of the tent humid. Tent air conditioners come in three common sizes: 5000 BTU, 6000 BTU, and 8000 BTU. A 5000 BTU A/C is ideal for a dome-style family tent or a medium-sized tent and is compact and runs quietly. In contrast, a 6000 BTU A/C can cool a large or extra large cabin tent up to approximately a 15′ by 10′, or a 150 square-foot floor plan. Lastly, an 8000 BTU A/C is suitable for an over sized cabin tent or extremely humid days. Window tent conditioners are more compact and are superior than room tent conditioners when it comes to cooling capacity. These types of units are mounted on a tent’s wall, window, or beside the doorway. On the other hand, room A/Cs sits upright and can be placed anywhere in the tent proximate to the power socket. This particular type of A/C features an exhaust to drive humid air out the window or any opening inside the tent. They also have a reservoir where condensed water settles. An excellent characteristic of room tent A/Cs is they’re very portable and easier to set up than window A/Cs though they can be bulkier and heavier than the latter. If you have a window style unit you will have to put it on a stand. An outdoor power cord that is at least 15amp rated is a minimum, you don’t want it to overheat next to the tent. A good camping tent air conditioner should have the following features: portable, has a superior cooling capacity, has the three basic air circulation features: dehumidifier, cooler, and filter, and lastly, it should cool even bigger tents for versatility. 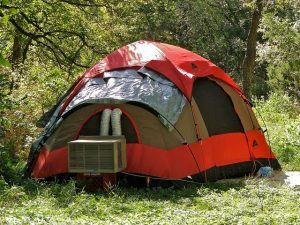 Verify that you need a tent air conditioner before spending money on one. Many wilderness areas cool down significantly at night and may be comfortable in a well-ventilated tent without an air conditioner. Remember, air conditioner units often require power sources and other equipment and take up extra room in what will likely be an already stuffed vehicle. Check weather reports and talk to other campers and forest rangers about typical nighttime temperatures before committing to a camping A/C unit. You can also drop from a heavy sleeping bag to a camping sheet to cool down at night.